The night itself had a great turnout, even if I missed the start due to family commitments. I managed to get into the event after Lauren’s presentation so to say I was gutted is an understatement. By all accounts though it was very well received. Remi had the unenviable task of following Lauren but did so with aplomb. 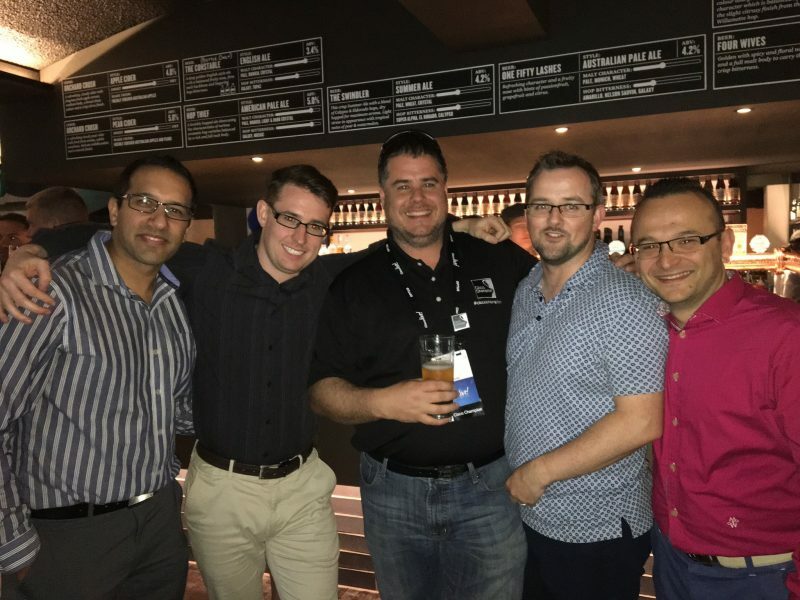 With Cisco Live being on we had a number of Cisco Champions attend and with the influx of new Cisco Champions in Australia it was the largest contingent of Cisco Champions in one location (within this region) outside of Cisco Live. 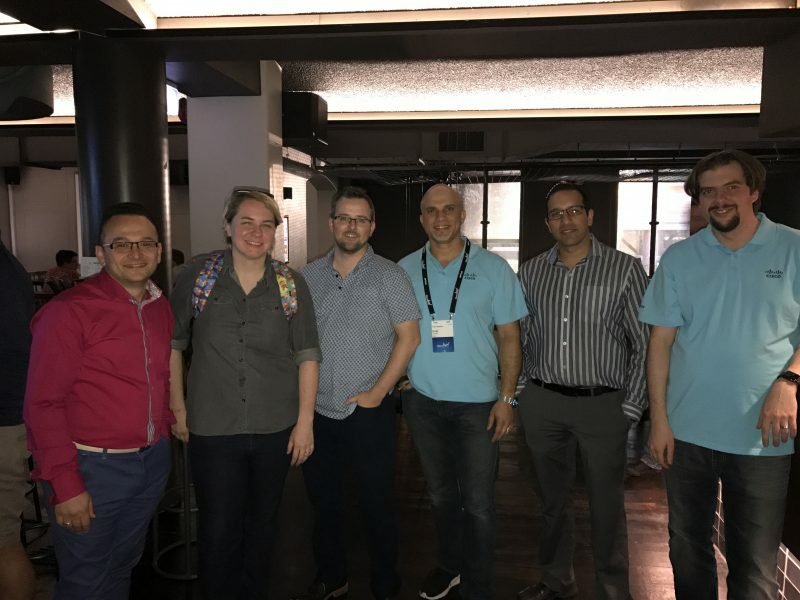 Some of the champions were unable to attend Cisco Live due to work commitments so the DCUG was an opportunity for everyone to get to know each other better. Cisco Application Centric Infrastructure (ACI) simplifies and accelerates the entire application deployment lifecycle for the next-generation data center and cloud deployments. Cisco ACI takes a systems-based approach and provides tight integration between ACI ready physical infrastructure and VMware virtual elements. Cisco ACI integration with VMware virtual environments offers customers the ability to leverage a common policy-based operational model across their physical and virtual environments. Lauren will show you how to use software-defined networking with a virtualization solution in VMware vSphere. You will learn how to seamlessly manage policies for virtual machines with Cisco ACI. In a modern data center one of the core challenges architecture and operational teams face is the ability to understand applications behaviour and dependencies, what is talking to who and when they are doing it. Without this knowledge it can be difficult to keep up with rapid application changes and services requests. If they had this knowledge they would be able to solve a number of perennial operations challenges. Generate micro-segmentation security policies, perform what-if analysis of any planned network or security change. Identify changes in application response times and perform detailed real-time searches on every application flow in the Data Center network. By leveraging Machine Learning, Big Data, Streaming Analytics and a rich set of sensor data Cisco is providing the tools for the Data Center network and security engineers to solve these and other problems. This session will introduce the operational details of the new system and its sensors. It will show how to leverage the application dependency mapping (ADM) functions, create granular security policy and import into policy-aware systems such as ACI. It will also explain how to use flow forensics to troubleshoot application performance and network issues as well as teach you how to perform ‘what if’ change impact analysis. Thanks to everyone that was able to attend and for making the DCUG in March such a special event. We’re continuing to run on the first Tuesday of each month and this months line-up looks to be a great one with Serge Charles presenting on Cisco HyperFlex and Chris Partsenidis present on Network Troubleshooting. If you are available it would be great if you can attend and to help us celebrate our 1 year anniversary. It was unclear when we began just where we were going to take the DCUG but we’ve seen it grow from strength to strength and with speakers of the quality we get every month, and particularly back in March, it looks like we’ll be around for some time yet. If you haven’t already RSVP to the Meetup group and we’ll see you there. This entry was posted in Champion, Cisco, DCUG and tagged Cisco Champion, Cisco DCUG, Cisco DCUG Melbourne, Community, DCUG. Bookmark the permalink.